Born Caryn Elaine Johnson on November 13, 1955, in New York City. Goldberg and her younger brother Clyde were raised by their mother Emma in a housing project in the Chelsea section of Manhattan. Goldberg’s father abandoned the family, and her single mother worked at a variety of jobs — including teaching and nursing — to make ends meet. Goldberg changed her name when she decided that her given name was too boring. She claims to be half Jewish and half Catholic, and “Goldberg” is attributed to her family history. With her trademark dreadlocks, wide impish grin, and piercing humor, Goldberg is best known for her adept portrayals in both comedic and dramatic roles, as well as her groundbreaking work in the Hollywood film industry as an African-American woman. Goldberg unknowingly suffered from dyslexia, which affected her studies and ultimately induced her to drop out of high school at the age of 17. In 1974, Goldberg moved to California, living variously for the next seven years in Los Angeles, San Diego, and San Francisco. At one point during this time, she worked as a mortuary beautician while pursuing a career in show business. During her stay in San Francisco, Whoopie Goldberg won a Bay Area Theatre Award for her portrayal of comedienne Moms Mabley in a one-woman show. Shortly after receiving this honor, she returned to New York. In 1983, she starred in the enormously popular “The Spook Show.” The one-woman Off-Broadway production featured her own original comedy material that addressed the issue of race in America with unique profundity, style, and wit. Among her most poignant and typically contradictory creations are “Little Girl,” an African-American child obsessed with having blond hair; and “Fontaine,” a junkie who also happens to hold a doctorate in literature. By 1984, director Mike Nichols had moved “The Spook Show” to a Broadway stage, and in 1985, Goldberg won a Grammy Award for Best Comedy Album for the recording of skits taken from the show. At the same time, she began to receive significant attention from Hollywood insiders. Director Steven Spielberg cast Goldberg in the leading female role of his 1985 production of “The Color Purple” (adapted from the novel by Alice Walker), a film that went on to earn 10 Academy Award and five Golden Globe nominations. Goldberg herself received an Oscar nomination and her first Golden Globe for Best Actress. Goldberg’s success with “The Color Purple” launched a highly visible acting career. Since 1985, she has appeared in over 80 film and television productions. Her early film credits include the spy comedy “Jumpin’ Jack Flash,” directed by Penny Marshall; “Fatal Beauty,” costarring Sam Elliott; “Clara’s Heart”; “Homer & Eddie,” costarring James Belushi; and the civil rights period drama, “The Long Walk Home,” costarring Sissy Spacek. Goldberg won numerous awards for her supporting role as Oda Mae Brown in “Ghost,” including an Oscar (becoming only the second African-American actress ever to win) and her second Golden Globe. The film, starring Demi Moore and Patrick Swayze, was a public favorite. That same year, the National Association for the Advancement of Colored People named Goldberg the Black Entertainer of the Year, and she also collected an Excellence Award at the Women in Film Festival. In 1991, Whoopie Goldberg appeared in the comedy “Soapdish” with an all-star cast featuring Sally Field, Kevin Kline, and Elisabeth Shue, among others. She then appeared as Detective Susan Avery in Robert Altman’s well received parody of the Hollywood movie business, “The Player,” starring Tim Robbins. Also in 1992, she starred in the enormously popular “Sister Act” as a world-weary lounge singer disguised as a nun hiding from the mob. Directed by Emile Ardolino, “Sister Act” earned Goldberg an American Comedy Award for Funniest Actress in a Motion Picture, as well as another Golden Globe nomination for Best Actress in a Comedy. The surprising success of this film led to “Sister Act 2: Back in the Habit,” directed by Bill Duke, and featuring Maggie Smith (reprising her role as Mother Superior), James Coburn, and then-unknown R&B artist Lauryn Hill. Goldberg launched her own television talk show, “The Whoopi Goldberg Show,” in 1992. Featuring Goldberg in one-on-one interviews with prominent political and Hollywood celebrities, the talk show ran for 200 episodes until 1993. That year, Goldberg also appeared in the feature film “Made in America,” Ted Danson. In 1994, 1996, and 1999, she hosted the Academy Awards making her the only woman to ever do so. Since 1986, she has also co-hosted Comic Relief, an annual live showcase of big-ticket comedians (including Comic Relief cohosts Robin Williams and Billy Crystal) to raise money for the homeless. 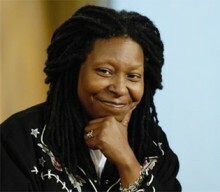 Whoopi Goldberg became moderator of the daytime talk show “The View” on September 4, 2007. She replaced Rosie O’Donnell, who left the show in May 2007, and still appears on the show today. In addition to being an actress, comedian and television personality, Whoopi is an author. She most recently released “Is It Just Me? : Or Is It Nuts Out There?” in 2011. Goldberg holds a Ph.D. in literature from New York University and an honorary degree from Wilson College in Chambersburg, Pennsylvania. Do you want to hire Whoopi Goldberg? Directly request a quote. In 48 hours we can send you the availability of Whoopi Goldberg If you would like to book Whoopi Goldberg, Entertainment Booking Agency is the right place. We will offer you the best price and contact the management or we directly contact Whoopi Goldberg. For corporate appearances or speaking engagements you can contact our agents and the will help you true the process. Tags: hire Whoopi Goldberg, Whoopi Goldberg booking, book Whoopi Goldberg, Whoopi Goldberg appearances, find more information on booking Whoopi Goldberg for appearances, Whoopi Goldberg speaking engagements, Whoopi Goldberg endorsements/spokesperson, Whoopi Goldberg appearance fees, Whoopi Goldberg booking agency contact info, biography of Whoopi Goldberg, Contact an artist booking talent agent find a speakers bureau that can book Whoopi Goldberg, speaker booking agency for Whoopi Goldberg, Whoopi Goldberg booking agency, Whoopi Goldberg booking for corporate event. EBA is one of the biggest entertainment booking agencies in the World. We book hundreds of celebrities, artist, athletes and speakers in a year. Important to know is that we are not claiming to be the management of Whoopi Goldberg. We are not the official agent for Whoopi Goldberg. Companies from around the globe book these artists and speakers true our company be course we have one of the biggest networks and we always have direct contact with the artist or the management. We help you to find the right celebrities for your corporate of private events. Please contact one of our agents to get free advice and we will help to get the world-famous artist on your party.